Bharath Polytechnic College is unique by virtue of its location in a calm and serene atmosphere surrounded by Green fields and a beautiful hillock. Admission for 2017-18 is going on. Bharath Polytechnic College was established in the prestigious year of Golden Jubilee of Independence of our Nation. The institution is recognized by All India Council For Technical Education (AICTE) New Delhi and Govt. of Tamilnadu and affiliated to Directorate of Technical Education Chennai (DTE Chennai). 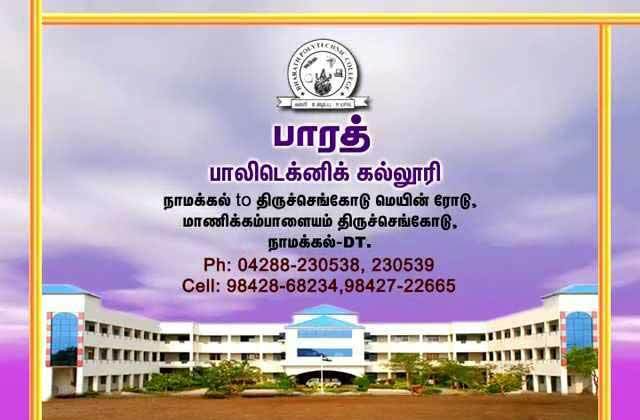 The Institution is situated at Manickampalayam on the State highway between Tiruchengode and Namakkal at a distance of 16 km. from Tiruchengode and 18 km. from Namakkal in the state of Tamilnadu. Near by railway stations are SankariDurg, Salem, Namakkal and Erode.